Persistence Market Research conducts a systematic and exhaustive review of the global cryotherapy market and presents some of the key components that are directly related to the future of the global cryotherapy market. The report titled “Cryotherapy Market: Global Industry Analysis and Forecast, 2016–2024” aptly represents all the necessary elements that embody the performance of this market. The report judges the performance of the global cryotherapy market across key geographies and highlights the opportunities available for companies operating in the global cryotherapy market. In this market study, the report focuses on the crucial developments that are likely to change the nature of the global cryotherapy market in the coming years. The team of analysts at Persistence Market Research has conducted extensive primary and secondary research to identify the main drivers, restraints and trends that are likely to impact the global cryotherapy market in the next few years. The report on the global cryotherapy market starts with an executive summary, key definitions and market taxonomy. The executive summary provides a 360-degree view of the global cryotherapy market followed by the market taxonomy that highlights the major segments of the global cryotherapy market. The next chapter of the report reveals key market dynamics including growth factors and challenges that are likely to influence the market volume and value in the next eight years. Pricing analysis and market forecast is also included in this report to get a clear idea about pricing assumptions, price projections per region, Y-O-Y growth and absolute dollar opportunity. The last section of the report focuses on some of the major companies holding principal share in the global cryotherapy market. The report reveals their future market policies and collaboration and acquisition plans that are anticipated to define the global cryotherapy market performance. Persistence Market Research has conducted systematic primary and secondary research to analyze the required data points to arrive at the overall market numbers. Primary research includes personal interactions with key market players across the value chain (technology developers, manufacturers, distributors, etc.) and other stakeholders operating in the global cryotherapy market. Data thus collected is validated using the triangulation method and scrutinized with the help of advanced tools to obtain pertinent qualitative and quantitative insights into the global cryotherapy market. The report encapsulates the key metrics that clearly describe the global cryotherapy market and uses the collected data to compare market performance across the various regions. This comprehensive analysis not only estimates the CAGR of the global and regional markets; but also considers Y-O-Y growth and absolute dollar opportunity to understand the market predictability and to identify the right opportunities likely to emerge in the global cryotherapy market. A BPS (Basis Point Share) analysis is conducted to understand the specific contribution of each segment to the development of the global cryotherapy market. Persistence Market Research has also created a unique market attractiveness index to showcase the future and present prospects of the global cryotherapy market to the principal shareholders. Indicators such as R&D expenditure, research funding from government and non-profit organizations, etc. have been considered to arrive at the estimated market numbers. All values of the market size are in US$ (US dollar). The global market for cryotherapy is highly fragmented with major players following prevailing trends of partnerships and associations to provide long-term best-in-quality services. Companies are rapidly collaborating with sports clubs, athletics organizations, and other complementary business providers to continue their organic business growth. For example, Impact Cryotherapy – a leading cryosaunas manufacturer and seller based in the U.S. – signed several pacts with multiple sports associations. Leading market players are in stiff competition to hold the maximum share of the global cryotherapy market. Some of the big names in the global cryotherapy market are expanding their portfolio of products to offer new or technologically advanced products to their targeted consumers. In May 2015, Erbe Elektromedizin GmbH launched ERBECRYO 2 Cryosurgical Unit for use in plastic surgery, which comes with a flexible cryoprobe to avoid destruction of surrounding tissue. The global cryotherapy market revenue is expected to increase at a CAGR of 6.5% over the forecast period (2016–2024). The North America cryotherapy market occupied more than 35% revenue share in 2015. An increasing number of surgical procedures in the region, rapid product launches and expansion of product indication are the primary factors driving the growth of the cryotherapy market in North America. This region is expected to be the fastest growing market for cryotherapy primarily due to the entry of major market players and emerging local players. Despite the fact that cryotherapy has been prevalent in North America for several years, expansion of product indications for aesthetic as well as medical purposes is expected to create a driving force for the growth of the cryotherapy market in the region. Within the forecast period, APAC region is likely to retain the third position in the global cryotherapy market. Growing installed base of cryosurgical equipment and cryochambers in countries such as China, Japan and Australia will fuel this regional market. APAC is expected to represent an incremental opportunity of more than US$ 200 Mn between 2015 and 2024 and is projected to contribute more than 15% to total incremental opportunity. The market is likely to grow between US$ 20 Mn to US$ 45 Mn annually over 2016-2024. The U.S will play a significant role in the expansion of the North America cryotherapy market. The U.S market is projected to cross a market valuation of US$ 1500 Mn by the end of 2024, registering a CAGR of 7.8% through the forecast period. The Canada cryotherapy market is expected to grow at a CAGR of 5.1% over the forecast period. Cryotherapy (except cryosurgery) is not readily adopted in Canada, leading to a sluggish growth of the cryotherapy market in Canada. Cryosurgery is preferred by most of the office based gynecologists in the U.S due to its efficiency to treat cancer lesions and prevent the recurrence of cancer lesions. Availability of skilled doctors and the necessary technology in hospitals makes it the most lucrative end user segment in the North America cryotherapy market. In the APAC region, Japan was expected to hold more than 25% of the global market share till the end of 2016 and is expected to lose more than 70 basis points by 2024. The China cryotherapy market is expected to expand at a CAGR of 8.1% over the forecast period. The market in China is dominated by a number of local players such as Guangzhou XZ Beauty Machine Co. Ltd. and SUS Advancing Technology Co. Limited. However, gradual entry of larger international companies such as Zimmer Medizinsysteme GmbH is expected to drive revenue growth of the China market. The cryotherapy market in India is estimated to gain more than 15 basis points by 2024. 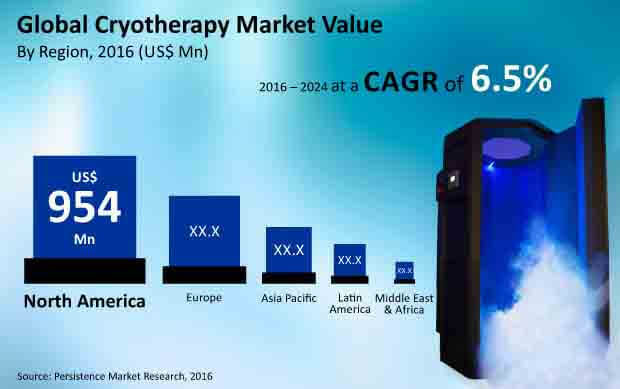 The Australia & New Zealand cryotherapy market is estimated to represent an incremental opportunity of more than US$ 40 Mn between 2016 and 2024. The increasing application of cryosurgery for the treatment of prostate cancer and inbound medical tourism for cryosurgery in Australia are likely to boost the growth of the cryotherapy market in the country.